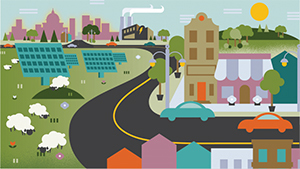 Electric utilities don’t have the same competition many other businesses do. Rather, customers are determined by where they live. So to keep these monopolies in check, different players provide oversight. Each state has a public utility or service commission regulating the utilities, as well as a customer protection group. In Wisconsin, the regulatory agency is the Public Service Commission of Wisconsin (PSC). The PSC regulates most of the state’s electric utilities. 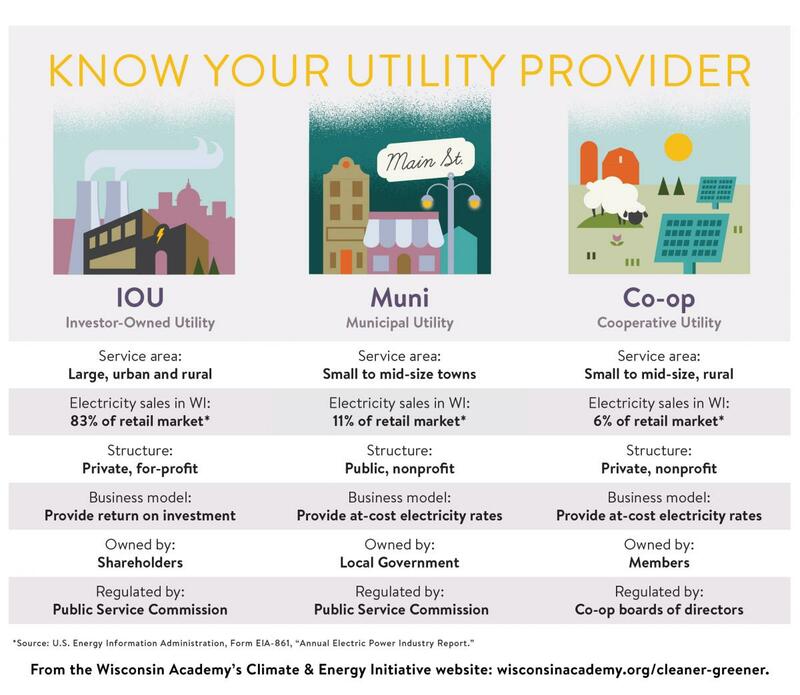 Specifically, it is charged with regulating IOUs and munis, which together make up 94% of Wisconsin’s retail electricity sales. Co-ops are the exception, since they are self-regulated by an elected board of directors. For consumer protection, most states rely on a public, state-level advocate. Wisconsin is one of just two states in the country where a non-profit organization takes on this role. In Wisconsin, this group is the Citizens Utility Board of Wisconsin. The PSC is the independent body tasked with regulating public utilities in Wisconsin. Since Wisconsin’s electric utilities lack competition (learn more about the history and monopoly status of electric utilities here)the PSC is responsible for ensuring adequate and reasonably priced service. The PSC is led by three Commissioners. These full-time Commissioners are appointed by the Governor and confirmed by the State Senate, and serve staggered, six-year terms. One Commissioner is appointed Chairperson by the Governor for a two-year term, and directs the Commissioners’ Office and oversees PSC staff. The current Commissioners serving in Wisconsin are listed here. The PSC reviews changes to rates, services, and infrastructure proposed by utilities. For each proposal, the PSC conducts a proceeding to record pertinent evidence used in arriving at a decision. Learn more about the PSC's processes for Rate Cases and Utility Project Review, and see below for more information on how you can participate in a proceeding. The National Association of Regulatory Utility Commissioners (NARUC) maintains information on the public utility commission or public service commission for all U.S. states. Go to the PSC’s interactive map, accept terms, type in your address, and click on the utility provider in the area. This will list the utility name, and what type it is: Investor-owned, Municipal, or Cooperative. This guide to public hearings explains how hearings work and how you can testify. The public can file comments with the PSC in cases related to electricity rate changes, construction, or other issues. If your utility sends an insert with your bill about a case they’ve filed, look out for an opportunity to file a comment on the case. There are over 2.6 million residential electric customers in Wisconsin, yet in 2017, fewer than 750 public comments were filed with the PSC across all dockets and cases. Public comments enter the formal record which Commissioners are required to review and consider in making determinations. You can also search for cases in the Case Management System.